Current: "I didn't expect it to be this good! "—is your comic store scrambling to keep up with MAESTROS? "I didn't expect it to be this good! "—is your comic store scrambling to keep up with MAESTROS? “I DIDN’T EXPECT IT TO BE THIS GOOD!”—IS YOUR COMIC STORE SCRAMBLING TO KEEP UP WITH DEMAND FOR MAESTROS? PORTLAND, OR, 12/21/2017 — Image Comics is pleased to announce that the third issue of MAESTROS, the darkly irreverent fantasy series from Steve Skroce (WE STAND ON GUARD), is being rushed back to print in order to keep up with customer demand. Skroce’s reputation for jaw-dropping worldbuilding technique extends beyond just the comics industry with his storyboarding credits on such Hollywood blockbusters as the The Matrix Trilogy and I, Robot. He also co-created Doc Frankenstein with Geof Darrow and the Wachowskis. In the series MAESTROS, protagonist Willy Little has been granted an unlimited and ultimate power by sheer happenstance when his god-like wizard-king father is murdered, along with the rest of the royal family. With the all-powerful Book of Remaking stolen by cutthroat thieves—and with Willy being the only one who can open it—it’s starting to look like his reign might be a short one. 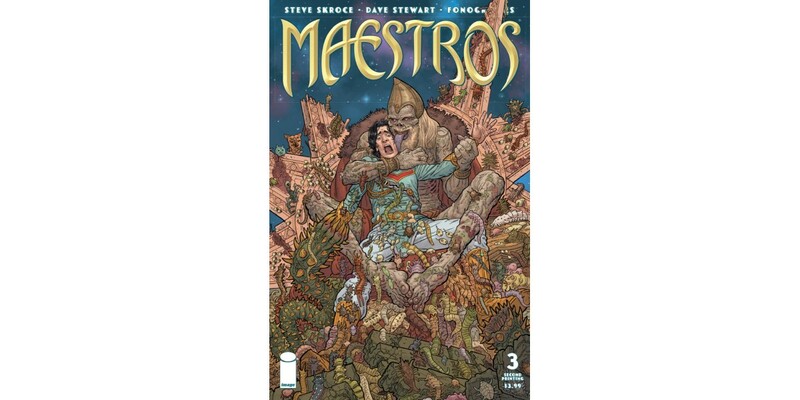 MAESTROS #3 will remain available for purchase across all digital platforms, including the Image Comics website (imagecomics.com), the official Image Comics iOS app, Comixology’s website (comixology.com), iOS, Android, and Google Play. MAESTROS #3, 2nd printing (Diamond code: NOV178105) and MAESTROS #4 (Diamond Code NOV170774) will both be available on Wednesday, January 24th. The final order cutoff deadline for comics retailers is Monday, January 1st.